Hey, Sister, What's Your Sign? Has your girlfriend (or ex-girlfriend) ever told you to stop being such a sloppy Sagittarius? Have you ever wanted to crack the shell of the cute but quiet Cancer shelving books in your local bookshop? Do you read the monthly horoscope columns in your favorite lesbian magazine and wonder what it all means? Well...attention all women who wear comfortable shoes, lipstick lesbians, and drag kings! Listen up, fems, butches, pillow queens, and all women who refuse to be labeled! HerScopes is the key to unlocking the mysteries of the stars, full of insight and enlightenment about every aspect of your life. Speaking as one girlfriend to another, Charlene Lichtenstein, one of the foremost astrologers in the gay and lesbian press, offers a comprehensive guide to the zodiac that is infused with wit, wisdom, and a nod to all that makes lesbian life unique. 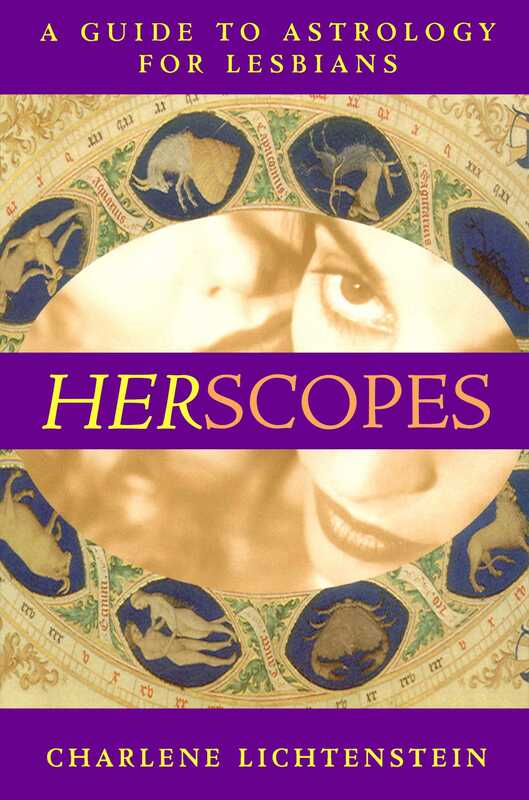 HerScopes offers a detailed description of the characteristics of women born under every sign, and a revealing glimpse into sign-by-sign compatibilty -- in love, in friendship, and in work. Complete with a list of famous gals (and some guys) who might share your birthday and irresistible profiles of some of your favorite stars and icons, HerScopes is a welcome resource for all the strong, smart, and courageous women striving to understand their place in the universe. The come-on line that launched a thousand possibilities would have to be "Hey, babe, what's your sign?" I must admit that I have used that old trick a thousand times, but unlike some less discerning women, I always listen very carefully for the answer. After reading this book, you will too. This handy-dandy volume of sun sign astrology is written expressly for women who love women but who also have to work, save money, grapple with personal challenges, deal with family and surly neighbors, welcome joy and prosperity, face defeat and awful bosses and perhaps even raise a brood of children who may change the world. It's for "fems," "butches," "lipstick lesbians," "drag kings," and women who refuse to be labeled (like those confounded Aquarians). Under all the exteriors, the lace and the leather, the buffed and the baggy, we are all the same, striving to make sense of our place in the world. Here is fair warning: Sun sign astrology is a simplistic first-step approach to a complete astrological personality analysis. This book is full of blatantly crass generalizations as well as a few derogatory snippets thrown in for humorous effect. Disclaimer: This book is for entertainment purposes only, so lighten up, girlfriend! Let's face it, not all Aries are bullies, not all Taureans are stubborn and crude, not all Gemini are shallow and false, not all Cancers are moody, oversensitive whiners, not all Leos are overbearing and vain, not all Virgos are sniveling hypochondriacs, not all Libras are ineffective lightweights, not all Scorpios are deadly connivers, not all Sagittarians are clumsy louts with gross and disgusting table manners, not all Capricorns are morose corporate sellouts, not all Aquarians are cold-blooded opportunists and not all Pisces are using sychophants. Some Aries are actually altruistic, mighty Aphrodite warriors, Taureans sensuous, cuddly bosom buddies, Gemini brilliant conversationalists, Cancers warm and nurturing full-bodied mamas, Leos generously gallant, Virgos sacrificing and magnanimous, Libras delightful, attractive companions, Scorpios zesty, experimental lovergrrls, Sagittarians jolly, fun-loving adventurers, Capricorns sentimental and forgiving compadres, "Aqueerians" all-giving, enlightened torch bearers and Pisces intuitive, romantic beauties. But do we ever get to meet them at the local dyke site? Probably not tonight, Irene! A careful reading of HerScopes might very well teach you something valuable about yourself and your life. An added benefit: It can also reveal things about that mysterious babe you've been eyeing from across the produce counter. Go on, sister, ask her...."What's your sign?" Our sun sign is the most important component of our astrological chart and gives us insight into our basic personality. It is who we are and who we strive to be. It's the clothes we wear to give the world a glimpse of our personal style, preferences and tastes. Do we like to draw attention to ourselves? Are we prim and proper? Do we drape ourselves in haute couture while wearing underwear from before the flood? Obviously some of us are precise, unassuming, tasteful or bold and some of us are dreadful slobs (no names, please...Sagittarius!). It's fairly common knowledge that there are twelve signs of the zodiac, but let's list them anyway. 12 times that you have to tell a Gemini to get her feet off the furniture...you get the idea. Each sign is categorized by an element and a mode. Elements describe your state of being, whether you are a fire starter, full of hot air, all wet or solid like a rock. Modes indicate how tolerant of change you are or how much action you can take. I'll explain further. There are four elements: fire, air, water and earth. Each sign is associated with one of these four elements. For example, fire signs are enthusiastic, energetic, extroverted, courageous and action oriented. They inspire others and heat up a room with their personal warmth. These zesty girlfriends are Aries, Leo and Sagittarius. Air signs are intellectual, friendly, sociable and conceptually oriented but a bit removed in their approach to others. Don't try to probe their feelings; they ain't gonna let it happen. These charming yet logical women are Gemini, Libra and Aquarius. Water signs are fluid, intuitive, comforting and emotionally oriented. They are the ones you want to cuddle with on a rainy night but avoid when the moon is full and they become Ms. Hydes. These introverted, sensitive babes are Cancer, Scorpio and Pisces. Earth signs are no-nonsense, stable, purposeful, physical and process oriented. They really seem to care about what others think of them and are the first ones to help any galpal when her life turns to sludge. These practical girlfriends are Taurus, Virgo and Capricorn. Old-time astrology books tend to match fire with air (air invigorates fire) and water with earth (water nourishes earth) but these are ridiculously wonky generalizations that will only prevent you from getting to know some pretty special gals a bit better. Each sign also has its own mode. There are three of them: cardinal, mutable and fixed. Cardinal signs are pushy broads whose raison d'etre is to create change, upend the landscape and move things along in whatever direction takes their fancy. They don't wait for the director to yell "action." They are action personified. Honey, you know the type. In case you were wondering, the Cardinal signs are Aries, Cancer, Libra and Capricorn. Fixed signs are at the other end of the spectrum, resisting change or trying to solidify and create stasis around changing conditions. They are the ones who say, "Hold on a minute. Let's catch our breath and see where we are." They can be immovable like a rock, but like a rock, when they start to move, get out of the way! The fixed signs are Taurus, Leo, Scorpio and Aquarius. Mutable signs are flexible souls, going with the flow and adapting to new challenges and situations. They are like the big oak that bends in the breeze but doesn't crack in half. The mutable signs are Gemini, Virgo, Sagittarius and Pisces. Each sign has its own particular combination of element and mode. For example, the only fire/cardinal sign is Aries and the only fixed/water sign is Scorpio. Therefore, it is easy to get a thumbnail sketch of any alluring siren at the bar by simply checking the chart below. Consider this your quick cheat sheet as you buy her another drink and delve deeper. Again, repeat after me, "Hey, babe, what's your sign?" then furtively glance at this chart when she replies. A final word on the sun sign: If you are a Cancer born on July 22 but feel more like a splashy Leo than a moist Crab, maybe you are indeed born under the sign of the proud Lion. What year were you born? You see, the sun changes signs every thirty to thirty-two days, shifting boundaries from one sign to another from year to year. This is why, if you were born "on the cusp" (two to three days before the end or the beginning of a sign), you may find that your sun sign varies from astrology book to astrology book, depending upon what year the book was written. Do yourself a favor if you are a cusp girl and either contact an astrologer or a local astrology school, or check an ephemeris book for your particular birth year. An ephemeris maps the movement of the planets through the signs on a daily basis for every year. It's the only way to know for sure what sign you really are. To make your life easier, each sign chapter ends with a page describing the personality of those mysterious gals who are born on the cusp. The purpose of this book is to provide a full description of sun sign characteristics and personality traits -- the good, the bad and the ugly. As you can see, locating your sun sign is relatively easy; just match it to your birthdate. But that's not all there is to astrology, girlfriends. The truth is that there is quite a bit of astrological life beyond the sun sign; we have every planet and many different signs contained in our complete birth chart. To learn even more about yourself (or someone else) strike a deal with an astrologer and get a copy of your (or her) complete natal chart. You will need more than just a birthday however; you'll need a full birthdate (with the exact year), birth time, and birthplace. Since no one is born at the exact same time at the exact same place, a natal (or birth) chart is unique to each individual just like a set of fingerprints. Now we're cooking with oil! For those intrepid souls who care to take the next astrological step, please check out my website at www.AccessNewAge.com/Stargayzer for details on how to order a natal chart and full analysis. The major components of a birth chart are houses, planets, signs and aspects. Houses represent where something is happening, planets show what is happening, signs show how it is happening and aspects show why it is happening. We've taken a swing at the signs for most of this introduction. Houses, planets and aspects are now in the batter's box. The astrological chart looks like a pie divided into twelve slices. These slices are called houses and represent different areas of our life. All the planets are dispersed through this house system like guests or squatters. Lesbian astrology doesn't stop at the simple house classifications. In fact, my sapphic sisters, three of the above houses have what I refer to as closets. The fourth house, because it represents family and ancestors, contains the "family closet" that can suppress our pride because we are afraid of what Mom, Dad and the rest of the straight crew may think, say or do. The eighth house, because it harbors our sexuality, contains our "sexual closet" that can stifle our physical fulfillment and intimate connections with others. The twelfth house, because it represents hidden enemies and things we hide from ourselves, is perhaps our most personally destructive "psychological closet." It can keep us from emotional and spiritual affirmation by conjuring up demons of what-ifs, even when the what-ifs may in fact be why-the-heck-nots? Each sun sign chapter in this book has a full analysis of each sign's closeted issues under the heading, "Shhh -- Secrets and Fears." Check them out and deal with them. Here is a brief listing of the major planets and what energies they manifest as they meander through the many houses in your astrological chart. So, if you have a chatty, carefree Gemini sun but have dour Saturn in secretive Scorpio in the third house of communication, chances are you measure your words very carefully and may even have a fear of public speaking. Go figure! Each of the following sun sign chapters in this book has a "Vital Statistics" section that lists, among other things, each sign's ruling planet, ruling house, element and mode. This is happily provided for those of us with lousy memories. "Vital Statistics" also includes lucky numbers, flowers, birthstones and even colors for each sign to help you in the birthday gift department. Also, just to pique your curiosity, I have included the tarot card most closely associated with that sign to give you further sign dimension. Aspects are the electricity between the planets in your chart. Some planets are so close to one another that they rub, chafe, and ultimately cause sparks to fly. Others are positioned at just the right angles and happily coexist with their respective energies. Dust off your protractor, babe, and try your hand at measuring your aspects. I tend to restrict aspect analysis to the following major five angles: conjunction, sextile (one of my favs), square, trine and opposition. We can get into many, many others, including quincunx (Hey, who are you calling a cunx??!! ), semisquares, semiconjuncts and a variety of other difficult ones but why bother? Life is stressful enough! Conjunction / 0 / Difficult -- minor collision, clash, pop! Flunked geometry? Don't worry, I'm not going to quiz you on aspects. Simply knowing that they exist may be helpful in case you decide to study astrology further. Here's one more thing to keep you up at night: Common astrological wisdom states that the sun sign reflects our basic personalities, but in fact women tend to reflect the characteristics of the sign of their moon until they reach the age of thirty. For you sweet young things under the age of thirty, find out what sign your moon is in and read that sign chapter along with your sun sign chapter. The moon changes signs every couple of days so consult an ephemeris to locate your moon sign. After the age of thirty (which marks the end of our Saturn Return -- three years of excruciating change -- which I explain and explore in the next section), we take on more of the characteristics of our sun sign. It's a glorious rebirth where we can feel our oats and maybe even the oats of a few bosom buddies as well. They say women over thirty blossom and have the ability and the wherewithal to attain their greatest dreams. When you are serious about settling down, choose a fully developed woman over thirty. There is no one better! I would be derelict in my astrological duties if I did not mention the Saturn Return phase of our lives. Saturn is the planet of discipline and impacts areas in our life where we feel inadequate or afraid. However, it also indicates where we learn hard-fought lessons as a result of difficult experiences. It is a rap on our knuckles, a stone in our lace-up hiking boots and a post-breakup Saturday night with a silicon toy with no batteries. Any place where Saturn resides in our birth chart is where we feel especially vulnerable, depressed or afraid. Nice, eh? The great thing about Saturn, if you can call it great, is that it is also considered the uber teacher of the galaxy. Learn your lessons and you can graduate to the next step. Screw up, young lady, and you can stay after class and repeat (and repeat and repeat) the lesson. Ouch! Remember, you need to look at your complete natal chart to see in what house Saturn sits and what sign it is in. There comes a point, every twenty-eight years or so (at ages twenty-eight, fifty-six and for the lucky few, eighty-four), when the planet Saturn, orbiting the sun in the cosmos, makes a conjunct aspect (did you pay attention to the paragraph on aspects?) to our natal Saturn. The effects of the Saturn Return last about two years like a slow-moving monster emerging from the muddy depths. So if you meet a frantic twenty-nine-year-old (or are a frantic twenty-nine-year-old yourself), go with the flow for another year no matter how painful it may feel. Things are shifting and changing so fast that you couldn't harness bedrock if you tried. (And, in retrospect, you may not want to park at that particular rocky bed.) Oh and another thing, relationships begun during a Saturn Return tend not to last. But they do provide interesting catty reappraisals and recriminations later. Lucky you. Saturn helps us come to grips with our deepest fears, whether we want to or not. If we face these fears head on, we emerge from this period of life stronger and more enlightened. During a particular Saturn cycle, we will face unavoidable situations that will make us face our fears and provide essential life lessons. Don't ya just love those life lessons? The Saturn Return heralds the end of a major life cycle and ushers in a period of great reevaluation, change and endings. You will have to ask yourself big and scary questions like: Are you living your life true to your own self or are you living in other people's "straight"-jackets? Use this time to review your life, whether it be in relationships, career, residence or family. But think rather than do. Don't begin anything new at this time (like a marriage or a new career) because there is just too much static on the line. Just use the time to reassess and ride the swelling tide. In which house does Saturn sit in your natal chart? Once you obtain a copy of your birth chart, check the house chart in the prior section. That will give you a clue as to where most of this turmoil originates. The good part is, as this cycle comes to a close you'll begin to reap what you have sown. You see, it has a happy ending, just like all those horror movies. Relax. Learn to expand your perspective and brace yourself for enforced changes, possible endings, and ongoing challenges and crises. Then make way for a time of new opportunities, new realizations, solidification and strengthening of foundations, new beginnings and maturity. Wisdom makes a great teacher, sister. If you have any questions or comments about this book or about astrology in general, or have an interest in a personal reading or compatibility analysis, please contact me via e-mail at Lichtenstein@AccessNewAge.com. My website at www.AccessNewAge.com/Stargayzer has new horoscopes every month and you can also send a free on-line astrological greeting card to a particular cutie. P.S. In case you were wondering, I'm Sagittarius, moon in Aquarius and Leo ascendant. Big mouth, big ideas, big ego. But let's not go there.